This view of cities and its corresponding view of human nature will no doubt strike some readers as quaint. But lest we dismiss it hastily, consider some problematic conditions of present-day cities and their adjacent suburban and rural landscapes. Consider also the mostly young people who bear the brunt of these problematic conditions, symptoms of two interrelated and problematic phenomena. One is the seventy-year experiment to physically reorganize human settlements around the automobile—a cultural aspiration and legal regime known as suburban sprawl.2 The other, beginning in the 1980s, is the rise of global cities,3 characterized as such by their attraction to and dependence upon a “creative class” of people with expertise in accounting, advertising, banking, information technology, and law, qualifications making them especially well suited to participate and flourish in, and to enable, the new and growing global economy. The aesthetic, economic, environmental, and social failures of sprawl are well elucidated in the writings of neo-traditional urbanism advocates, such as Strong Towns and the Congress for the New Urbanism (CNU). But what has become most striking about the rise of certain global cities is the growing importance of location and a corresponding boom in the value of urban land. Urban land is a finite commodity, and the rise in land value has made these increasingly elite cities unaffordable not only for the poor, but also for the middle class. Indeed, it is one of the causes of a shrinking urban middle class. This explosion in urban land value is even more important than the “end of distance” that some anticipated social media would enable. This urgency has prompted renewed interest in Henry George, the nineteenth-century political economist and land reformer, and specifically in the idea and merits of land value taxation and some possible forms in which a land value tax (LVT) might be implemented. One of these forms entails a marriage between an LVT and a New Urbanist idea called transect-based zoning. Though I hope to indicate the possible fecundity of that union, such an approach to an LVT is neither the most common nor the most obvious. I intend to describe other possible approaches as well, all with both the modesty that follows from not being a member of the economists’ guild, and the impertinence of one who thinks some subjects are of sufficient import that they should not be left uncritically to experts. Because consideration of land use in so much of the modern world occurs in the legal and cultural context of suburban sprawl and hypermodernist urbanism,4 I want to begin with the idea of transect-based zoning before moving on to Henry George and the land value tax. Transect-based zoning (aka form-based codes or FBCs) is a New Urbanist idea conceived as an alternative to currently normative use-based zoning, which first emerged in the United States in the early part of the twentieth century. Use-based zoning came into being for reasons good and bad. In part it responded to the early effects of the industrial revolution on premodern cities: large factories, noxious emissions, rapid population growth, physically overtaxed road, water, and sewer infrastructure, and so forth. On the other hand, it was a naïve application of modern utilitarian rationality (“form follows function”) and also partly used as an agent of social control—a tool for powerful interests to keep “undesirable elements,” usually black people, in their “proper place” by means of exclusionary zoning of lot sizes and housing types. Use-based zoning’s characteristic effect, however, especially as it developed in post-1945 automobile suburbs, is indicated by its name. Various activities of quotidian human life—home, work, school, shopping, worship, recreation—were organized into separate zones, typically accessible only by car. A gradient of urban building and population densities. However, when New Urbanists set out in the 1980s and ’90s to work with residential real estate developers on walkable, mixed-use settlements, it quickly became apparent that existing zoning ordinances—indeed, existing sprawl culture, including bank lending practices, federal housing programs, state Department of Transportation regulations, and a host of other institutional conventions—would not allow it. And so New Urbanists set out to change these institutional practices, beginning with changing use-based zoning ordinances in order to level the legal playing field for developers wanting to make walkable, mixed-use settlements. The new zoning ordinance type that New Urbanists invented was the transect-based code. The idea of a transect is derived from late nineteenth-century geographers, who first employed it to depict gradients in a natural environment. The New Urbanist insight was to extend the idea of a natural transect to depict a rural-to-urban gradient, and to recognize its potential as the basis for a different kind of zoning ordinance. A common New Urbanist transect diagram pragmatically divides an ideal world (i.e., one with no suburban sprawl) into realms of rural and urban, and then depicts a gradation of urban transect zones, ranging from less dense to more dense. The diagram itself then becomes the basis for a different kind of zoning code that zones not on the basis of building use (where what is not permitted is forbidden), but rather on the basis of building type and density (where what is not forbidden is permitted). New Urbanists have had significant success in getting transect-based codes adopted, not only for greenfield site developments prior to the 2008 housing crash, but also as exclusive or overlay codes in some major U.S. cities, including Denver, Miami, Cincinnati, and Nashville. The results of all this New Urbanist effort, particularly the greenfield projects, is sometimes dismissed as “just a prettier form of sprawl.” But New Urbanist greenfield developments have always existed side by side with less well-publicized urban infill efforts, which have increased in both number and emphasis since 2008. Further, the alternative to a mixed-use New Urbanist greenfield development is generally a single-use sprawl development occupying considerably more rural land. And if the adoption of transect-based codes by major cities has not (yet) led to an urban renaissance, there is the deeper problem that the culture of traditional urbanism and architecture was lost for at least two generations over the course of the twentieth century. A renaissance of good urban building and good urban culture is a slow boring of hard boards, and likely a long-term cultural project. There is at least one conspicuous aporia, however, in common New Urbanist polemics, and it has to do with land value and its implications. New Urbanists market themselves to both developers and public officials with the true claim that good urban design creates economic value. Moreover, the Charter of the New Urbanism professes that the traditional towns and city neighborhoods they champion should be just and economically diverse environments, with housing affordability across class lines; and that this goal can be achieved by promoting a variety of urban housing types in addition to the single-family detached house. These might include the granny flat or coach house ancillary dwelling unit, the apartment above the store, the attached single-family row house, the bungalow court, the duplex, the two-flat, the triple-decker, the six-flat, the corner lot twelve-flat, and the U-court apartment building. New Urbanists have come to characterize these housing types as “missing middle housing,” by which they mean older urban housing types now generally absent from a spectrum that once included the detached single family house at one end and the mid-rise urban apartment building at the other. The New Urbanist argument has been that provision of missing middle housing in quantity can be facilitated by transect-based zoning that makes such housing legal as of right; and that this increased housing diversity and quantity will increase both affordability and the population density needed to support pedestrian proximity to urban advantages, like neighborhood schools, parks, storefronts, and public transit. However good this seems in theory, anyone paying attention knows that the rent for a four-hundred-square-foot coach house in San Francisco (or even in Seaside, Florida) is and for the foreseeable future will be well beyond the reach of most middle-class Americans. And here the New Urbanist narrative fails to account for how much the affordability of housing depends upon the value of the unimproved land on which it sits. Furthermore, under our current property tax regime, housing affordability itself is undermined by the value that New Urbanist designs create insofar as good urban design encourages speculation in land. Thus, ironically, New Urbanists too are complicit in long-standing American practices that resulted first in suburban sprawl and subsequently in the affordability crisis of contemporary global cities. Land value plays an increasingly central role in the financial speculation connected to these crises. Hence the growing recognition that to get genuine housing diversity at more affordable prices in desirable towns and cities—and to encourage better urbanism in less popular towns and cities—it is necessary to take land speculation out of the development equation. And this is the source of today’s renewed interest in Henry George and the land value tax. Land value taxation is an idea with practical roots in English common law,6 but the origins of land value tax theory can be found in the classical economists Adam Smith, David Ricardo, and John Stuart Mill.7 Today, however, the land value tax is commonly associated with the late nineteenth-century American social theorist Henry George. Renowned in his day, George was later overshadowed both by his British predecessors and by twentieth-century economists, including such rock stars as John Maynard Keynes and F. A. Hayek. Henry George was thus largely forgotten over the course of the twentieth century. Indeed, he became something of a cult figure, and his land value tax policy prescriptions (also known as the single tax theory) correspondingly marginalized. Nevertheless, Georgist theory was quite popular in the late nineteenth century. George’s 1879 book Progress and Poverty sold three million copies, and in 1886, he narrowly missed being elected mayor of New York. More than one hundred thousand people paid respects at his funeral in 1897. The basic assumptions and features of a land value tax begin from the Georgist definition of land and unimproved land value, which I present below, along with a table differentiating a conventional property tax (levied on both land and buildings) from a land value tax (levied upon land alone). Unimproved land value is the dollar-amount-worth of a piece of ground and/or its land without any buildings or improvements on it. Value is typically calculated based on its location and comparable vacant land sales. The primary difference between a conventional property tax and a land value tax is shown in the following table, which depicts two different methods of raising $5,000 of tax revenue from a block divided into two parcels of land. The top section illustrates an example of how taxes are collected on property evaluated as the sum of the value of the land plus the value of any buildings. A vacant parcel is assessed at $100,000, and the owner is taxed $1,000 (or 1 percent of the assessed property value); a parcel with buildings on it is assessed at $400,000 ($100,000 for land and $300,000 for buildings), and the owner is taxed $4,000, or the same 1 percent tax rate on assessed property value, raising a total of $5,000 in tax revenue from the two parcels. The bottom section illustrates an example of how taxes would be collected on the unimproved land value of each parcel irrespective of any buildings on it. Both parcels (vacant and/or occupied) are assessed land values of $100,000 each, and their owners are taxed $2,500 each, or a tax rate of 2.5 percent of the assessed unimproved land value. In this way, the same total of $5,000 in tax revenue is raised from the two parcels. This table indicates some of the mechanics that differentiate a conventional property tax on land and buildings from a tax on the unimproved value of land alone; and in this example, both methods raise the same amount of tax revenue. Their implications and possible consequences for good differ significantly, however. (1) Land is properly differentiated from private property. Human beings have rights of ownership to what we produce and improve and exchange (i.e., private property). But we do not have rights of ownership to natural resources that no human being produced, resources that come from nature and are, in fact, common goods (e.g., air, water, land, mineral resources—the resources on which all human life and society depend). Therefore, though one may properly hold exclusive title to use land, this is not to be confused with ownership of land. Rather, it is an exclusive entitlement to a common patrimony authorizing the titleholder’s private and profitable use—with the proviso that the use of such a common good is properly subject to a user fee paid to the community in the form of a tax on the unimproved value of the land. Some land may be valuable as a source of precious finite minerals and taxed accordingly. For example, oil has been taxed to create both the Alaska Permanent Fund and the cash dividends distributed to its residents. And some land may be valuable and taxed accordingly by reason of beauties bestowed by nature (as owners of beachfront property will attest).10 In most instances, however, the value of land is directly related to its proximity to social goods (i.e., to value created by other people). The Georgist argument is that such increases in the value of land—and in the value of land alone—are both properly subject to taxation and are the most just, rational, and efficient source of public revenues. That this is true follows from a second observation. (2) When you tax something, you generally get less of it. Economists recognize that taxes create externalities, which can be good or bad, intended or unintended. Most of us understand intuitively that this is true, because we understand that some taxes are designed and imposed precisely to decrease certain behaviors. Such taxes include not only Pigovian taxes (after the early twentieth-century British economist Arthur Pigou) levied to recover the social cost of some private activity (e.g., environmental pollution), but even an LVT itself, which can be understood in part as a tax on unearned wealth, imposed to decrease it. There are also plain old “sin taxes” imposed to discourage things of which at least some people would like there to be less: on tobacco and sugary drinks; or, say, concrete frame construction and glass curtain walls. Our most visible taxes, however, have externalities largely hidden from public understanding. Taxes on the productive activities associated with both labor and capital all have the presumably unintended consequence of decreasing the productive effects of each—e.g., taxes on sales, on business profits and investment income, on buildings and improvements associated with property taxes, on capital gains and inheritances, even graduated taxes on income. And this leads to a third (and critical) Georgist point. (3) A tax on land cannot diminish the quantity of land. For most of the twentieth century up to the present, neoclassical economists have regarded land as simply another form of capital. But this was not true of the eighteenth- and nineteenth-century classical economists, who recognized that land differs from both labor and capital due to its temporal and material priority, its fixed supply, and its immobility.11 Land also differs from other assets (e.g., buildings) in that it does not depreciate in value, but rather grows as the community invests in its shared infrastructure. G. K. Chesterton once quipped that, whereas God can make something from nothing, man is the being who can make something from anything. That “anything” in the first instance is land. Unimproved land is humanity’s most basic material resource, the foundation of all material wealth, required directly or indirectly for the human production of all goods and services. One can’t make any more of it; one can’t hide it in a Swiss bank account; and one can’t move it to the Cayman Islands. Labor receives wages for work, capital receives interest for investment, and land receives rent for the exclusive (monopoly) use of a location. For several reasons, then, Georgists argue that taxes on labor and capital should be eliminated in favor of a single tax on the value of unimproved land (i.e., an LVT) as the primary source of public revenues. Taxes on labor and capital diminish both, but a tax on unimproved land does not diminish the underlying resource. Meanwhile, a tax on land returns to the community either the value of some shared natural resource or the value of the land which the community itself has created; and a tax on land is an efficient and transparent method of taxation. But is land not a form of wealth? And if a land titleholder is to be taxed for the full rental value of his or her land, what is the benefit of holding title to land? Here again, consider that, strictly speaking, land is not wealth. Rather, land—all natural resources independent of human production, which belong to everyone—is the precondition of wealth, and is to be taxed for human use; whereas wealth—the material and intellectual products of human labor, which by right belong to the laborer—is not to be taxed at all. I mentioned earlier that economists familiar with Georgist theory (which is far from all) generally do not disagree with the Georgist analysis, regardless of their political dispositions, and they acknowledge the effectiveness, simplicity, clarity, and fairness of a land value tax. Their disagreements are rather about issues such as (1) whether it is possible to adopt an LVT as a single tax on a national scale; (2) if not, whether a modified and partial LVT is desirable and possible, either for its own sake or as a transition to a single tax regime; and then finally (3) if a partial LVT is desirable, two related and properly political issues remain: the size and scope of government services, and how much tax should be levied on the value of land. (1) The Full Henry George (for example, as advocated by John Médaille and Fred Foldvary13): a single tax to be paid annually, applied at the scale of the nation-state, but collected locally, replacing most if not all other taxes at federal, state, and local levels, at close-to-full taxation of the ground rent of unimproved land as set by the market. Henry George himself recommended collecting about 95 percent of the full market ground rent, with the balance remaining with the land titleholder as a kind of profit or management fee. The rental value of any particular parcel of land would be determined by comparable vacant land sales in the immediate vicinity, or by comparisons to similar parcels occupied by similar buildings in different but broadly proximate locations. Land value reassessments could occur annually, biannually, or triannually, but with the development of contemporary digital mapping tools, such as ARC-View, ARC-GIS, and more recently GAMA, land value assessment from an office desk is becoming an easier task than determining the value of land plus buildings for present-day property tax assessments.14 Also, there can be little doubt that long-distance, absentee landlords and other land speculators are themselves employing these tools for their own land-banking purposes. (2) A Halfway Covenant, so called because even though it imagines essentially the same dynamics of assessment, collection, funding of public services, and elimination of other taxes as the “Full George” above (and at the same scale), it would nevertheless collect only a portion rather than the entire rental value of land—just enough to fund the specific government services desired, a larger or smaller sum depending upon the proclivities of the electorate and the political party in power. Even if the Halfway Covenant yields sufficient funds, however, the problem remains that, by leaving some substantial portion of the rental value of land in the hands of the titleholder, it might not end land speculation, the practice of land banking, and the negative consequences that follow therefrom. A more doctrinal Georgist would probably prefer to tax closer to the full value of the land and distribute any surplus funds back to the public in the form of a cash dividend (again, like the Alaska Permanent Fund). (3) A Local Building Tax/Land Tax Reversal: This third approach more thoroughly modifies Georgism by simply changing the conventional property tax (that assesses both land and buildings, but emphasizes the buildings) such that land is taxed at a significantly higher rate than buildings. In the United States, the most prominent example of this type of taxation is in Pittsburgh, where it has been employed off and on for over a hundred years, most recently in 1978 when land was taxed at a rate six times higher than buildings.16 The results at the time were impressive, and some of its effects remain so. Conventional property taxes penalize owners for improving their buildings by causing their taxes to rise, thus rewarding land banking and inflating real estate prices. But Pittsburgh and other places have demonstrated that when you implement an LVT, you get not a real estate price boom, but rather stable land values and a construction boom. Moreover, even after a construction boom saturates market demand, under an LVT, what remains thereafter are stable land values and more affordable housing in which the home and its activities rather than the land are the genuine source of personal wealth. (4) A Revenue-Neutral Regional LVT across a Transect: Returning to the idea of a rural-to-urban transect, I conclude with this last example, not to suggest it as the best arrangement everywhere, but rather as a thought experiment to address current difficulties.18 The full benefits of an LVT seem to require its application at a certain scale, and an LVT will be inefficient if the scale is too small. Unlike transect-based zoning, an LVT can’t be introduced as a “pilot project” for a small area or even a city because the success of the LVT will raise the value of adjacent (non-LVT) land, and land banking will just move to properties located “across the street,” as it were. The minimal optimal scale at which to adopt an LVT is likely at the scale of a metropolitan region that also includes a natural or agricultural landscape at its perimeter. Even though the details of land use relating to local zoning and development should arguably be under municipal or even neighborhood jurisdiction, there are some issues best administered at a regional level due to their externalities: energy policy, big-picture land use policies (related to human settlements), agricultural production, landscape preserves, major regional roads, public transportation, equitably financed public education, water treatment, and so on. What would be some immediate and predictable effects of a new LVT regime? (1) An LVT would very quickly stabilize land values and effectively end land banking, either definitively by capturing 95–100 percent of a land parcel’s ground rent as a tax paid to the community, or virtually through the incentives created by whatever tax is charged on either the use or the sale of underused urban land. (2) An LVT often prompts a construction boom because it incentivizes development of underused land, by means of both stick (the tax on the rental value of the land) and carrot (the absence of tax on improvements to and productive activities on the land), rewarding both the construction of new buildings and the renovation of old ones. Vacant lots acquire new buildings; shabby buildings become renovated buildings; towns and city neighborhoods get tidied up, and become more vibrant and desirable. Although these new and renovated buildings are economic assets in themselves and, over time, raise the ground rental value of the land on which they sit, that value grows only gradually, mostly on the basis of the construction quality or the renovation of the land’s occupying buildings. This is because the rental value of the land, the rapid rise of which is so devastating on young people especially, has been taken out of the building and development equation by the LVT and is now going to the community. (3) Under an LVT, after a construction boom ends, the price of housing remains stable. Boom-and-bust housing cycles are minimized because, again, boom-and-bust housing cycles are due to the land speculation that is necessarily absent under an LVT. Likewise, when there is a demand for new construction, ground rents will rise slowly in accordance with the value of everything being built. This is because the ground rent is being taxed, and thereby taken out of the development equation. From a political standpoint, if an LVT causes total taxes to go up for the average renter and homeowner, the LVT is dead in the water. The revenue-neutral regional LVT across a transect proposal must be particularly conscious of this problem (because of the four scenarios considered it is the one most completely designed). We are not without actual examples to consider here, however. Pittsburgh’s most recent LVT, which began in 1978, required landowners to transition from paying a standard property tax to paying a split tax that assessed the value of land at six times the value of buildings. According to Dan Sullivan, “most homeowners paid far less [in taxes] under a Land Value Tax, absentee owners tended to pay more, the very richest neighborhoods paid more, the corporate property paid more. The skyscrapers paid less, but the [owners of the lots next to them] paid more.” Every tax regime produces winners and losers, so who wins and who loses under an LVT scenario? (1) Renters win. Renters under most LVT regimes will pay few if any taxes beyond sin taxes. Moreover, the LVT is likely to spur construction of better, more affordable, and more stable rental housing because these are the features that will give landlords advantage in the rental housing market. (2) Most homeowners win. The majority of land-titled homeowners whose home is their major asset should expect to see their total tax liability go down, though owners of homes on larger tracts of land might see a rise in their taxes (cf. Pittsburgh). Homeowners will not profit as much (or at all) from the sale of their home beyond the value they have added to it themselves, though the upside is that, should they wish to sell and move up or down, they will find housing prices more stable everywhere under an LVT regime. And under most LVT regimes, the LVT will replace some, if not all, other taxes. (3) Land-titled entrepreneurs, especially small ones, win big. Contrary to the Pittsburgh model cited above, land-titled entrepreneurs in an LVT regime are likely to see their total taxes go down significantly: possibly on the land itself if there are height restrictions, and if they are already using their land well; this is almost certainly a result of having to pay taxes on neither business profits, nor productive activity of any kind, nor any improvements they make to their land. (4) Land speculators lose. Under an LVT, the taxes of landowners who are land banking, waiting to sell or develop only after adjacent parcels have been developed by others, will go up significantly. An LVT will give them a strong incentive either to develop their property or sell it to someone who will. As with everyone else under an LVT, they can profit from their labor and their capital investments; and their other taxes will diminish or disappear, but not the taxes they will pay on their (underused) land. (5) The community wins big. Finally, the community gains a stable and durable source of revenue. Land, moreover, when taken out of the speculative market, will appreciate more gradually over time, while landowners who now will have strong incentives to build more and better buildings will not be penalized for doing so. In most cities in the United States today, housing inflation and deflation is land value inflation and deflation. Today’s prohibitively expensive global city housing and economically stressed low-density automobile suburbs are two sides of the same coin. Land banking in cities creates artificial scarcity that drives development to less expensive rural land made affordable by federally subsidized but economically unsustainable sprawl infrastructure. When land is considered capital rather than a common resource to be used, the full development potential of land is neither paid for nor rewarded. The result is what we have now: a rise in unaffordable cities and a multiplication of failing automobile exurbs. Is a land value tax too complex to implement? Compared to what? Our current opaque system of disincentives to work and invest? Of invitations to chicanery? Of distributing unearned wealth to the land-titled, while gutting the middle class and erecting nearly insurmountable obstacles to the economic advancement of the young and the poor? The question is not whether beautiful, convenient, and affordable cities and towns, under a simple, clear, and fair LVT regime, are impossible dreams. The question is whether we have the cultural capital, political acumen, and artistic skills to once again make such places. To be sure, important LVT details remain: “grandfather clauses” temporarily exempting elderly homeowners on fixed incomes; how best to transition from a property tax to an LVT; and the role of LVT-exempt institutions in civil society. But such details are not unresolvable. Given my biblical view of human nature, as fallen but with the possibility of—and a trajectory toward—redemption, my hopes for a land value tax and a revival of classical humanist urbanism are genuine and substantive, though modest. Neither Georgism nor good architecture and urbanism are salvific, nor do they warrant cultish devotion. But compared to our current tax system and the social and economic distortions it engenders, an LVT would be a simpler, more transparent, more easily administered, and above all more just tax. Walkable, mixed-use towns and city neighborhoods comprising durable and beautiful buildings would realize human flourishing much better than our ubiquitous sprawl suburbs. Perhaps the rearrangement and recovery of fundamental things, such as fairer taxes, more beautiful and well-tended landscapes, and good urbanism can only occur in the aftermath of catastrophe. Many already regard both sprawl and our current economic arrangements as catastrophic. Nevertheless, it would be a welcome development even now for New Urbanists, both political parties, and all interested citizens to embrace land value taxation as an essential nonpartisan component of good urban economy, based upon the truth of what land is. The promotion of walkable, mixed-use human settlements across a rural-to-urban transect should also be a bipartisan effort. The problems these policies can solve concern many Americans, perhaps a majority, across political lines. The solutions await their political champions. 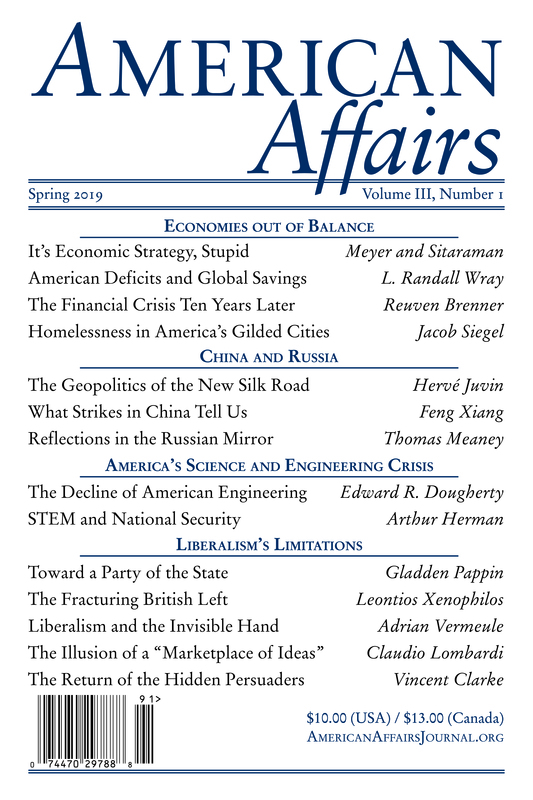 This article originally appeared in American Affairs Volume II, Number 1 (Spring 2018): 56–75. 1 For a more detailed exposition of this characterization of classical humanist urbanism, see my “City Stories of Nature and Grace: An Urban Pilgrim’s Progress,” Communio 43 (Winter 2016): 558–95. 2 The complaint is not about automobiles per se, but rather three generations of public policies and subsidies to physically organize human settlements exclusively around the automobile. 3 The term “global city” is used here after the work of Saskia Sassen, The Global City: New York, London, Tokyo (Princeton: Princeton University Press, 1991) and her various interpreters. 4 For a more extended characterization of hypermodernist urbanism, see my “Building on Truth,” First Things no. 249 (January 2015): 47–53. 5 Not all New Urbanists will agree, but what is new about New Urbanism is its effort to promote traditional urban form in a legal and cultural context (i.e., sprawl) in which for more than two generations it has been literally illegal to make walkable, mixed-use urbanism. Hence the need for a legal as-of-right alternative to use-based zoning. 6 D. J. Webb, “Why Libertarians Should Support a Land Value Tax,” Ludwig von Mises Center for Property and Freedom, September 27, 2012. 7 Josh Ryan-Collins, “How Land Disappeared from Economic Theory,” Evonomics: The Next Evolution of Economics (blog), April 4, 2017. See also Josh RyanCollins, Toby Lloyd, and Laurie Macfarlane, Rethinking the Economics of Land and Housing (London: Zed Books, 2017). 8 This is also the problem even with successful Community Land Trusts. Admirable as they are on a case-by-case basis, they don’t address the larger systemic practice of land banking and the latter’s relationship to shortages of urban housing at stable prices. 9 Ted Gwartney, “Estimating Land Values: The Nature of Land and Natural Resources,” Understanding Economics (blog), Henry George Institute. 10 Alternatively, such land may be kept from development and held in reserve as a public trust—perhaps a relatively easy policy transition in the aftermath of rising sea levels and destructive storm surges. 12 I am indebted to personal correspondence with John Médaille for this characterization. 13 John Médaille, “Taxes, Economic Rent, and Externalities,” Distributist Review (blog), January 16, 2009; and Fred Foldvary, “The Implementation of Land Value Taxation,” Progress.org, November 1, 2015. 14 Tom Nunlist, “Virtual Valuation: GIS-Assisted Mass Appraisal in Shenzhen,” Land Lines (October 2017), 8–13. 16 Dan Sullivan, Saving Communities (blog) and “Land Value Tax and Community Land Trusts,” Lecture in Motala, Sweden, 2014. 17 By way of close analogy, think of a too-small LVT zone as similar to rent control. The latter provides a great benefit to tenants in rent-controlled apartments, but (if I understand correctly) its simultaneous and necessary unintended effect is to raise the cost of apartment rents outside the rent-controlled zone. 18 For a site specific example of a revenue-neutral regional LVT across a rural-to-urban transect, see “Hunting LaFox,” a conjectural future history of metropolitan Chicago Kane County and the fictional Town of LaFox, Illinois. 19 For a succinct summation of what I think is and is not objectively wrong with suburban sprawl, see my “A Realist Philosophical Case for Urbanism and against Sprawl” (two parts), Public Discourse, July 11 and 13, 2011. Philip Bess is a professor of architecture at the University of Notre Dame.